Red Sox at Tigers, 1:10 p.m. Pitching: RHP Steven Wright (13-6, 3.33 in 2016). Pitching: RHP Michael Fulmer (11-7, 3.06 in 2016). 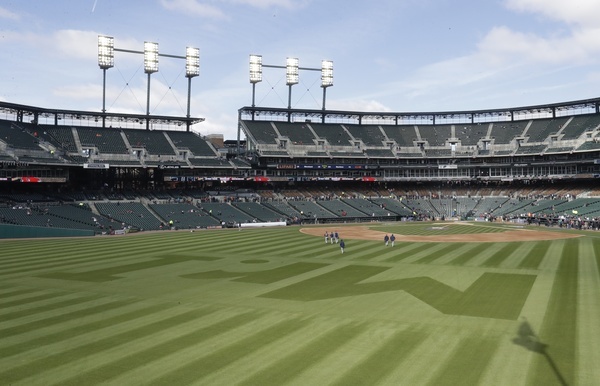 The outfield grass at Comerica Park was landscaped to pay tribute to the late Detroit Tigers owner Mike Ilitch. DETROIT – The flu bug has swept through sports teams throughout time. It just seems the Red Sox have had more of their share early in the season. The latest victim was Hanley Ramirez, who was out of the Sox lineup along with Mookie Betts for Friday’s game against the Tigers. Brock Holt, who had the flu, returned to be the team’s DH in a makeshift lineup that was the result of bereavement leave because of of deaths in the family of shortstop Xander Bogaerts and relief pitcher Matt Barnes. First base coach Ruben Amaro Jr. also had to deal with the death of his father, Ruben Amaro Sr.
Robbie Ross Jr. was placed on the 10-day disabled list because he had influenza. The Red Sox roster is in flux, yet they’ve been able to withstand and were 2-0 entering Friday’s contest. Red Sox president of baseball operations Dave Dombrowski took it all in stride, and said there’s now opportunity for others, including Marco Hernandez, who started Friday at shortstop – only his second major league start at short – and relievers like Noe Ramirez and Ben Taylor. “We certainly get to see some of our other players and what they can do. It’s a great opportunity for them. We’d love to have everyone back and I think that should happen soon. But we’re dealing it with it and we have the personnel to be able to fill the spot and we feel they’re quality players,” Dombrowski said. The closest thing to this was in 2008 when the Red Sox had a flu outbreak after the team had traveled to Japan, then Toronto, Red Sox manager John Farrell recalled. Brock Holt is the first Red Sox DH to lead off a game since Pedro Ciriaco on 9/25/2012. Sox hope for a big outing from Steven Wright today as Sox lineup minus Bogaerts, Betts and Ramirez could use some help. Tigers take 1-0 lead in bottom of the first on Victor Martinez's sacrifice fly to left field. Ian Kinsler scored from third. Not the start Wright had hoped for but he minimized the damage with one run. Doesn't have a great feel for the pitch yet. Sox loaded them up in the third with two outs against AL ROY Michael Fulmer, but Mitch Moreland struck out on a high fastball. Brock Holt hit an infield single and Dustin Pedroia followed with a single before Andrew Benintendi was hit by a pitch to load the bases. But MItch Moreland struck out to end the threat. 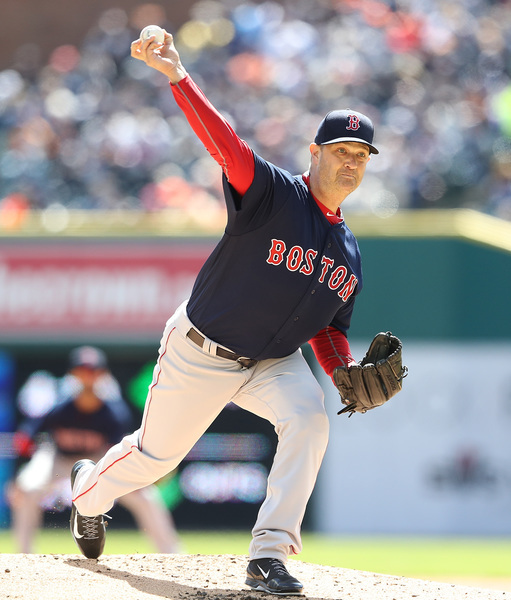 Steven Wright is making his first start of the season. Wright has had the benefit of two GIDP's by Tigers through three. Tigers 1-0. All the Red Sox need is some offense. Wright has found the feel on his knuckleball with two K's in the 4th. Sandy Leon threw out a runner. Pablo Sandoval's leadoff double in the fifth goes for naught. Sox making good contact off Fulmer but cant seem to get the big hit. Tigers grab 2-0 lead after Castellanos tripled with one out in the sixth and was driven in by Victor Martinez. you'll note that in the 6th inning John Farrell signaled for his first intentional walk to Miguel Cabrera under the new no throw rule. James McCann smacks two-run homer to give the Tigers a 4-0 lead. Steven Wright's day is done after 6 2/3 innings. Steven Wright goes 6-2/3 innings, 4 runs, 4K's, 3 BB. replaced with two out in the seventh by rookie Ben Taylor making MLB debut. mitch moreland breaks an 0-for-12 with an 8th inning single. The Red Sox finally get on the scoreboard in the eighth inning. They trail 4-1 with the tying run at the plate. Chris Young's double scores Sox 1st run in 8th off Bruce Rondon. Two hits and a walk. Former Sox RP alex Wilson in the game. Sox score another. Jackie Bradley Jr. singles to right field, scoring Mitch Moreland. Sox trail 4-2 with two men on and one out. Pablo Sandoval gives the Red Sox a 5-4 lead with a three-run opposite field homer in the eighth. Wow. Pablo! hits a three-run opposite field bomb on an 0-2 pitch to give Red Sox a 5-4 lead in the eighth. They trailed 4-0. Sandoval had just 5 games in 2015 with multiple XBH. Double (vs Fulmer) and HR (vs Rodriguez) came vs changeups today. If the Red Sox hang on, Ben Taylor would be credited with a win in his big-league debut. After retiring the first two batters of the eighth inning, Heath Hembree walks a pair of batters and is pulled. Red Sox lead 5-4 with two outs in the bottom of the 8th. Robby Scott in to pitch for the Red Sox. An 8th-inning blown save in a daygame for Red Sox in Detroit at a time when Boston's bullpen roles are unsettled. This has happened before. those two two-out walks by Heath Hembree were killers. Robbie Scott gives up the tying single to PH Mikie Mahtook. Joe Kelly walks in the go-ahead run. Tigers lead 6-5 in the bottom of the eighth. Evidently Joe Kelly has no confidence in his ability to throw fastballs for strikes. All sliders when he needed a strike. Red Sox finally get out of the inning, trail 6-5 heading to the ninth. More on that point: Kelly threw four straight sliders after falling behind 2-1 to JaCoby Jones. Chris Young popped up with runners on second and third to end the game. Tigers win, 6-5.